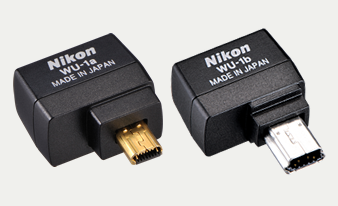 Note: Remove the WU-R1, the rubber part of the WU-1b Wireless Mobile Adapter, to connect with Nikon 1 AW1, J3, S1 and V2. Attach the WU-1a/ WU-1b Wireless Mobile Adapter onto your camera and enjoy two-way communication with smartphones and tablets. With this device, you can transfer images to your smart device directly without using a computer, or use your smart device as a remote shutter-release for your camera. * Compatible with iOS and Android OS, the WU-1a/ WU-1b will give you more ways to share your images. *Cannot be used for recording movies, Motion Snapshot or Smart Photo Selector. Note: Downloading the Wireless Mobile Utility, available at application stores, is required to use the WU-1a/ WU-1b Wireless Mobile Adapter. For details about the software, please read the specifications provided by application stores. Android and Google Play are trademarks of Google Inc.
Attaching the WU-1a/ WU-1b onto your camera enables you to download images into your smart device. Select "Download pictures from the camera" from the Wireless Mobile Utility to view a list of images in your camera, and choose the photos you want to download to your device. The downloaded images can immediately be uploaded to an SNS or attached to emails, for easy sharing with family and friends. You can use your smart device as a remote shutter to snap pictures with your camera. Tap "Take pictures remotely," and the smart device will display the view through the lens. Convenient for when you want to avoid even the slightest blur caused by pressing the shutter release button on the camera, or if you want to be in the picture yourself.